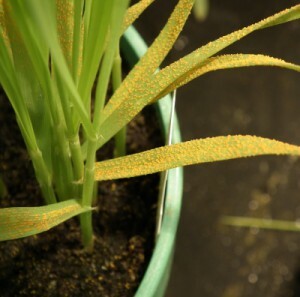 Yellow rust is caused by the pathogen Puccinia striiformis. Symptoms appear as parallel rows of yellowish orange coloured pustules on the leaves of plants, usually slowly developing over the winter. In the spring, small patches of infected plants can often be seen. Severe infections quickly cause chlorosis, and later necrosis, of leaves resulting in death of the tissue in May/June if the weather conditions are warm and dry. 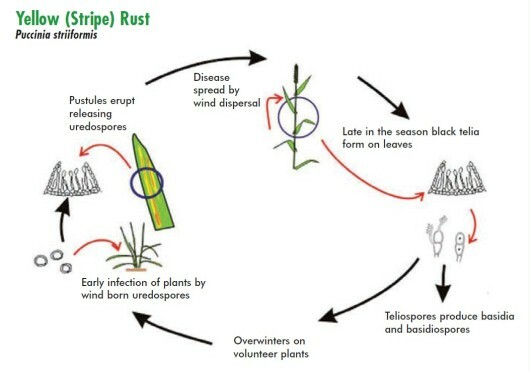 Due to the recent mild weather conditons, yellow rust is being reported in suceptible varieties of winter wheat. 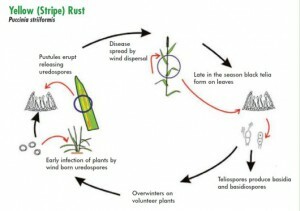 The infections will remain viable unless the temperature drops low enough to kill the leaves that are infected. However, low temperatures will slow the disease down or hold it at the current level. Some varieites are only susceptible to infection at the seedling stage and resisitance to the diesease will develop after stem extension. There is currently no action needed to combat the disease, but an early T0 will most likely be needed in high risk situations.